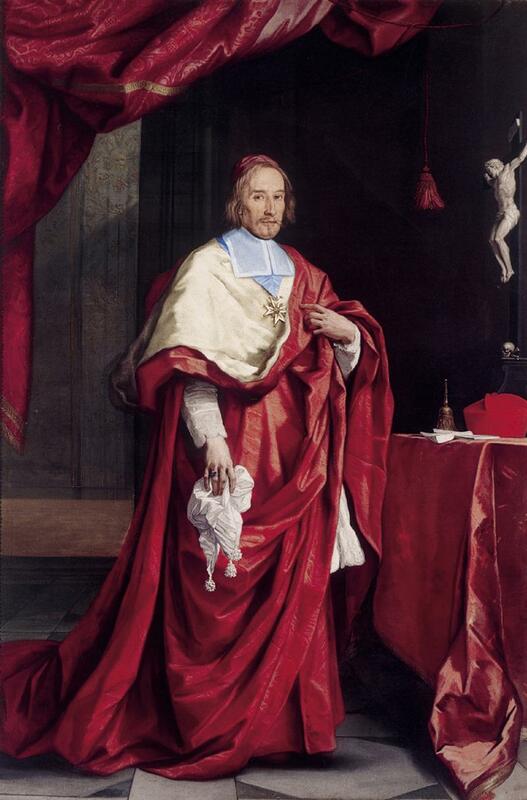 With the typical unscrupulousness of the Popes of the time, in 1628, Urban VIII ordained his nephew as cardinal when he was just twenty. In a short time, Antonio Barberini gained a prominent position in the Roman Curia, where his brother, Francesco, and his uncle, Antonio the elder, also sat in the college of cardinals. To celebrate his role and the power of his family, which was enormously increased because of the protection of the Pope, at the beginning of 1634, Antonio decided to finance, with the fabulous sum of 60,000 scudi, a large Saracen Joust in honor of Prince Alexander Carl Wasa of Poland, who at that time was on a visit to Rome. His intention was the joust had to be the culminating event of that year’s Carnival and it would then remain in the memory for posterity. Piazza Navona was chosen as the scene of the joust. For several centuries, in fact, the Carnival jousts and other chivalric trails were held in that square. The literary conception of the joust was entrusted to the poet Fulvio Testi, who was resident (akind of diplomat) of the Duke of Modena, while the staging was commissioned to architect Francesco Guitti, from Ferrara. We have several testimonies of this formidable joust. 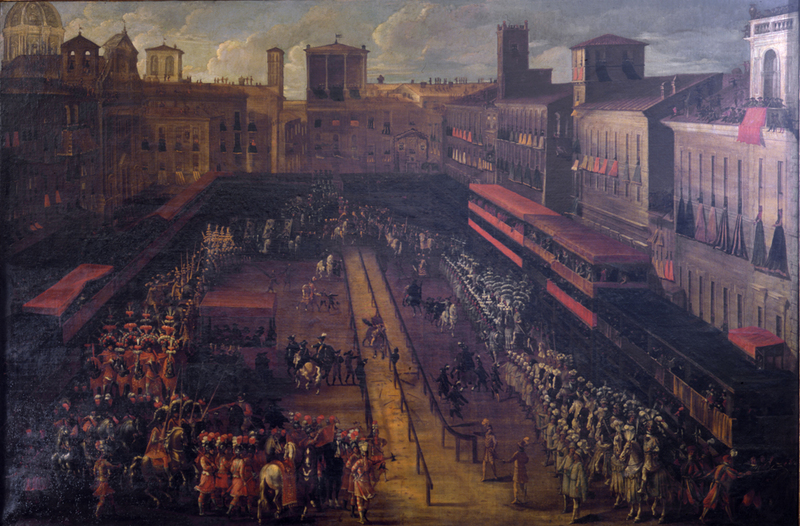 Beginning with two beautiful paintings, preserved in the Museo di Roma at Palazzo Braschi, one by Filippo Gagliardi and Andrea Sacchi, which offers an overview of the square, and the other attributed to Giovanni Ferri, giving a closer view. 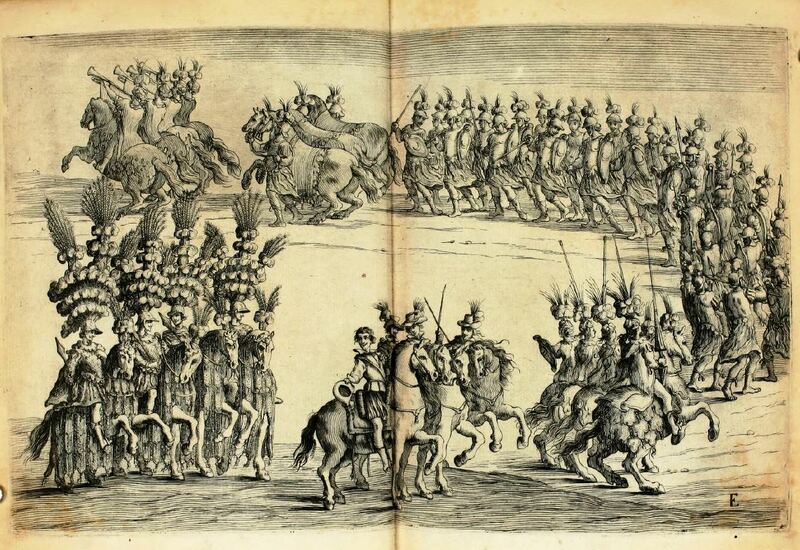 We also have a detailed account of the event by Cardinal Guido Bentivoglio, published in 1635, and enriched by splendid drawings by Andrea Sacchi. The Saracen Joust is a special type of chivalric trial that consists of charging, at the canter, and hitting, with a spear, a rotating dummy that is placed on top of a pole. Usually the dummy has his right arm armed with a mace, or a lash, and has a shield on his left. According to some, this exercise would be based on that of the palus (pole, in Latin), described in Vegetius’ Epitoma rei militaris (IV-V century A.D.), which was used to train Roman soldiers to strike with the sword. The Saracen Joust was also called Quintain and included the variant in which, instead of hitting the dummy, the rider had to insert the tip of his spear in a ring suspended from the dummy’s arm. It is called “Saracen” because the rotating dummy typically had the features and clothing of a Moor, i.e. of a Muslim, like the pirates who, having come from North Africa, raided tat the time he Italian coasts. On the contrary to what we see today, in many re-enactments of this type of Joust (for example in Arezzo, or in Ascoli Piceno), originally the rider did not have to hit the shield of the dummy, but its head. In fact, if the rider hit the shield he was penalized. This is explicitly explained in the “chapters to be observed in the Feast,” that is to say the rules of the joust held in Piazza Navona in 1634.
Who will hit the shield, or other place in the body of the Saracen, breaking or not, will lose a stroke among those already gained or between those he still has to gain. The score was then awarded as follows: three points (“strokes”) to the rider hitting the dummy on the front (“from the eyebrows up”), where a specific target was placed (“the sign adjusted for this purpose”). Two points were awarded if the rider hit the face (“from the Eyebrows to the Mouth”), one if he hit the chin (“from the Mouth to the Chin”). These areas were delimited by lines drawn on the dummy’s head (“the distinction made apparent by the lines”). To be valid, the blow had to produce the rupture of the tip of the spear, which for this purpose was made of a softer wood than the one used for war spears. In the event that the blow just produced the detachment of the tip of the spear (“ferrule”), but without breaking the wooden pole, the blow was considered invalid, while if the spear had hit one of the lines that divided the target, i.e. the head of the Saracen, the rider was awarded with the score associated to the lower part of the target, that is to say the lowest. If the rider hit the shield, or another part of the dummy’s body, whether breaking the spear, or not, he was still penalized by one point. Finally, if, during the charge the rider lost his spear, sword, hat, stirrup or bridle, he lost the “charge”, that is to say that he received no points. SIRE, sometimes the riders get tired of doing always the same thing and they find too difficult and sometimes painful to often repeat the exercise of confronting each other entering the lists; instead they enjoy the ring joust, of which they rarely get tired. But considering this exercise not martial enough, the more inventive among them found an intermediate exercise, which consists in placing the figure of a man in the same position and at the same height as an opponent who is facing them at the lists. Fully armed, they break their spears against this silhouette, which they also call Quintain, attacking it as they would do with a real man; thus performing an exercise that is halfway between the fury of facing each other at the lists and the gentleness of the ring joust: the point at which to break [the spear] is in the head, the best blows are the ones above the eyes, in the forehead, the less good are those who hit below. And if some evil man-at-arms hits the shield that the Quintain has on the left arm, this last turns on a pivot, and it is likely to hit the one who uses his spear so badly, who thus loses his charge because of his bad grace. (PLUVINEL, 1625, pp. 138-139 [1627, pp. 177-178). 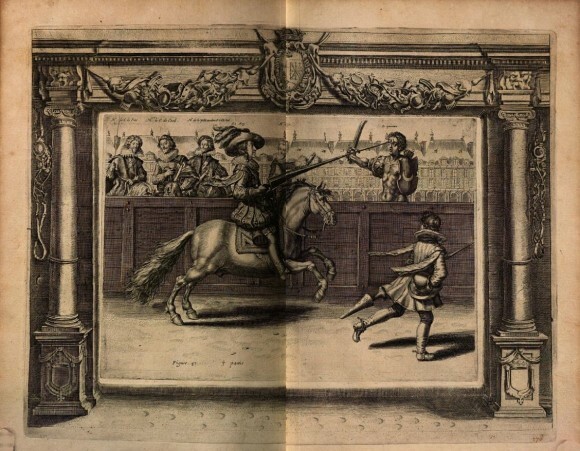 The author’s words are made explicit by one of the wonderful plates by Crispin de Passe the young, which decorates Pluvinel’s book and make it one of the most beautiful treatises about horsemanship ever. In plate number 47 we see the king in the act of hitting the Quintain (which looks like a Roman emperor, armed with sword and shield, and with his head crowned with laurel). The sovereign hits a target at the center of the dummy’s forehead. In the background, some courtiers and the author mounted on horseback watch with a pleased expression, while a page follows the rider closely, carrying a new spear. 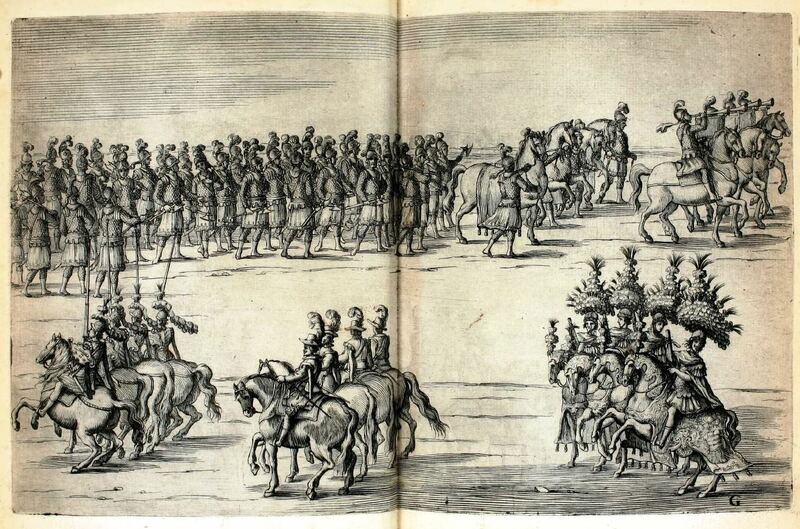 PLUVINEL, Antoine de, L’instruction du Roy en l ’exercice de monter à cheval, desseignées & gravées par Crispian de Pas le jeune, Paris, M. Nivelle, 1625.